Finding pests in your house is less than ideal. It doesn’t really matter what kind of pest you find, the last thing that you want is to have to cross paths with them at all. The good news is, there are various ways that you can reduce the chances of finding pests in your home. That being said, one of the first things that you need to do is know where pests are most likely to be found in the first place. At Earthwise Pest Management we love providing the Sacramento area with the information and guidance that they need to minimize the chances of pests in their homes. Taking proactive measures is one of the many things that we suggest is checking the common spaces in your home to ensure there aren’t any infestations. Keep reading to discover the five most common spaces in the house where pests can be found. Unfortunately, the last place that you really want to find pests is in the room where you store your food, prepare your meals, and eat. We hate to be the ones to tell you that pests are most commonly found in the kitchen, but the reality is that they are. In fact, the kitchen is the space in your home that is most likely to draw pests in. 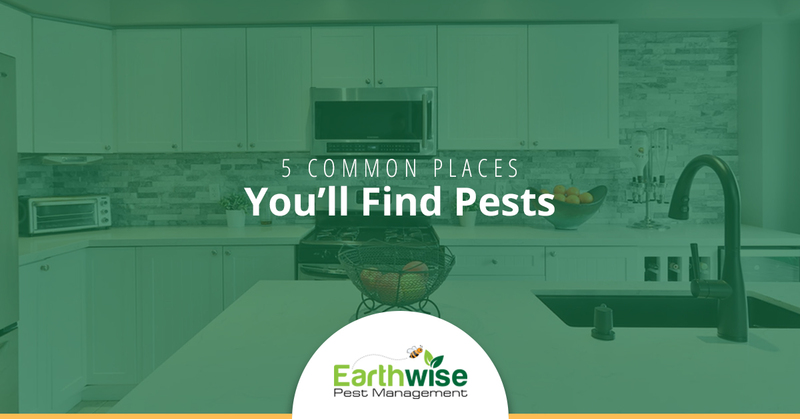 Given that one of the most important things for pests to find in order to survive is food, you can guarantee that they’re going to make their way into your kitchen. Once they’ve found a food resource that they can rely on, you can guarantee that they’ll find a dark, hidden space to turn into their home. If you’re looking to avoid the chances of pests coming into this your kitchen, the most important thing that you can do is keep the space clean. That means doing things like wiping down the counters, properly storing your foods, cleaning up scraps and crumbs, and taking out the trash when needed. All of this will reduce the chances of pests finding a food source in the first place. We just finished talking about a food source and how vital it is for pests to find food sources and how great the kitchen can be. Well, let’s take that to the next level and talk about the spaces that you’re storing your food in. Not only do pests find a food resource in your pantry, but the dark spaces make it a perfect place for them to hide as well. Again, the best way to prevent any pests from thinking that your pantry is suitable is by storing all of your foods in air-tight containers that keep pests out. In the case that there is an infestation in your pantry, you’re going to want to toss all goods that they could have gotten into. This will reduce the chances of the infestation continuing after treatment. Food source is one of the most important things that pests need to find when they look for a new home, but a dark and safe space to hide is the next thing that they’re in need of. For that reason, it’s the dark and hidden parts of your home that you should always be checking. There are so many different spaces in the house that pests could be hiding in, and the last thing that you want to do is let them go unnoticed. We always suggest sticking to a schedule where you check the dark and undisturbed places in your home to ensure that they’re pest free. And, if they’re not, at least you’re able to tackle any pest problems early on. When you think of places in your home that you’re unlikely to check on a routine basis, you probably skip right over your attic. The reality is. However, that very few people actually utilize this space of their home. What was once used for additional storage has been replaced by spacious basements, attached garages, and backyard sheds. That leaves the attic being used for HVAC systems and dust buildup. Aside from that, your attic is a great space to keep pests hidden away. Since very few people use their attics, it’s very common for mice to build nests or pest infestations to mature. While it isn’t the most ideal space to have to check on a regular basis, it is something that you should stay on top of to ensure that there aren’t any pests turning your attic into their new home. Some of the pests that do the most damage can be found in an attic. Termites, for example, feed off of wood and can go for long periods of time without being spotted. While your garage isn’t directly in your home, it’s one of the places that you need to keep an eye out for. Your garage offers easy access for pests to come in and find a home. There are often cracks, holes, and openings that make it easy for them to make their way in. Since they aren’t in a space that we really “live” in, it’s easy for us to go without tackling any pest problems immediately. Rather than let that be the case, make sure that you’re always staying on top of any pests that you find in your garage and get all infestations taken care of immediately. In the case that you find pests in any of the spaces that we’ve listed above, reach out to Earthwise Pest Management. We provide full-service pest control to residencies in the Sacramento area. From bed bugs and snakes to termites and fleas, we have years of experience providing high-quality treatments that offer long-term solutions. Contact us today to schedule your pest management solution.